Since people started using digital voice coding, such as ISDN, they have thought about convergence between telephony and IT environment in order to transmit data, voice and video applications using one and the same medium. Unfortunately, each of these applications has different needs. Data transmission requires variable line bandwidths and doesn't care for reliability of connection, and, on the contrary, voice and video transmissions need a constant bandwidth and guaranteed time of delivery. The structures of available networks are different and only meet the needs of the application they have been created for. In data networks, everyone can use the available bandwidth to the maximum extent, which means that the line capacity is exploited efficiently. On the contrary, telephone network reserves a channel per call regardless of data transmission (e.g. one party is speaking only during a standard call -> there is no data transmission from the non-speaking party but the channel keeps busy). A lot of voice and video transmission technologies using real-time IP networks (Internet), generally called VoIP(Voice over IP), have been developed as an alternative to the standard circuit-switching telephone network. As a result of natural selection, only two of them are now implemented in telecommunications, which improves interaction and compatibility of products from different companies. These two technologies are H.323 and SIP. 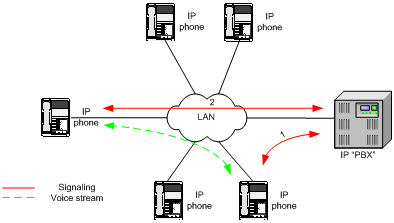 Voice and signal communication channels are strictly separated in the VoIP network. Signal sessions are mostly administered by a server, which replaces a standard PBX in the IP environment. The voice stream is created point-to-point between end sides. For better understanding see the following diagram. 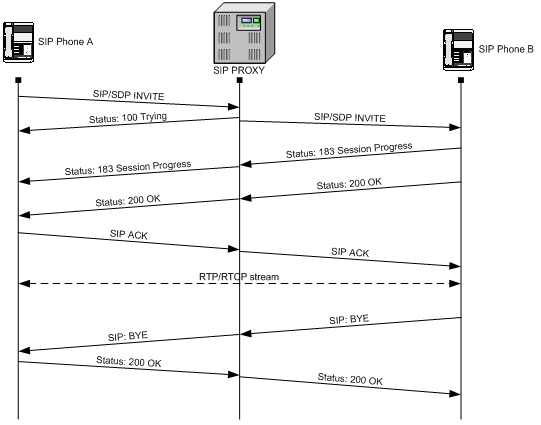 The SIP (Session Initiation Protocol) is a text-based protocol, similar to the HTTP and SMTP, designed for initiating, maintaining and terminating of interactive communication sessions between users. Such sessions include voice, video, chat, interactive games, and virtual reality. Location Server – receives registration requests from the UA and updates the terminal database with them. All server sections (Proxy, Redirect, Location) are typically available on a single physical machine called proxy server, which is responsible for client database maintenance, connection establishing, maintenance and termination, and call directing.